Something about trains makes me feel like a little kid again. 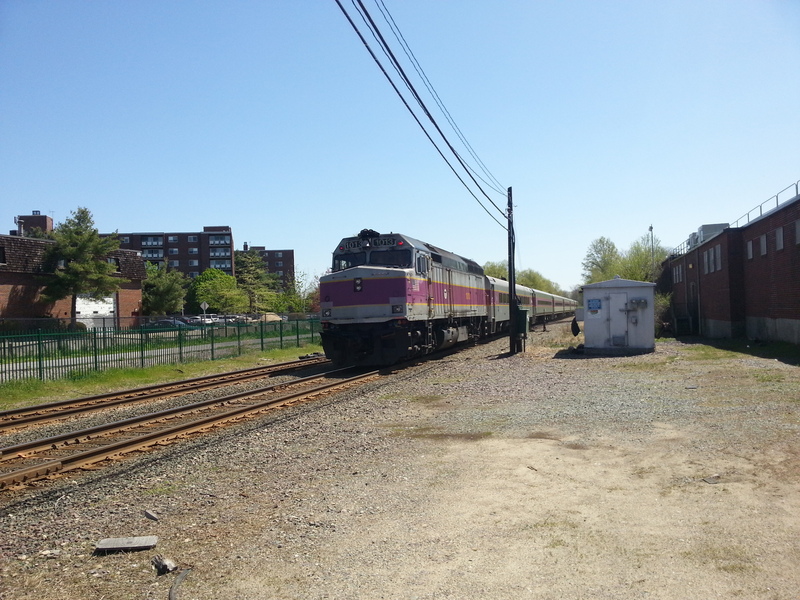 I waved to the engineer as the commuter train went by me. I don’t know what it is, but I have loved trains since I was a little boy. In fact, my favorite toys of my childhood were my electric trains. And I love traveling by train. Anyway, it was a treat for me to watch it pass by. Sometimes these little things really brighten my day, and my day was actually pretty good already. Once we got home we unloaded the car, put everything away, and had some time to do a few things around the house with our remaining daylight. We cleaned out some junk that needed to be tossed, did some organizing in the hallway and basement, started a load in the washer, and even had time to appreciate the garden. It meant a lot to me that I got to plant a few things this year, since last year we had no time or money to do anything. Pewter tankard of perry is optional when gardening. That box on the railing holds some Black-seeded Simpson (a loose-leaf lettuce) and some Parris Island Cos (a Romaine lettuce). You can see on the right edge of the photo some of the red Romaine too. Gardening is indeed more enjoyable with a tankard of cold perry to drink. 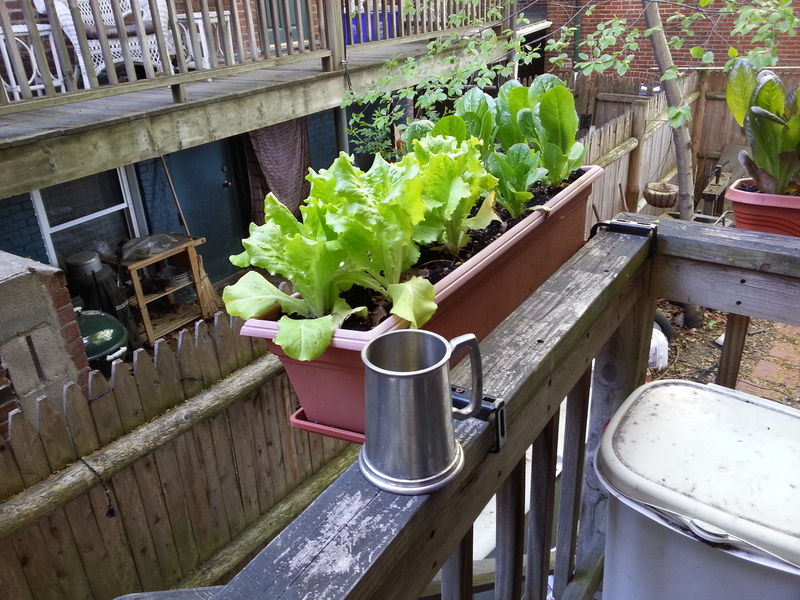 It’s tough to garden when you have a tiny shaded yard, but the containers on the deck seem to have done well in years past so maybe this year we will get a good crop of lettuce. I will put up some pics of the herbs sometime too. 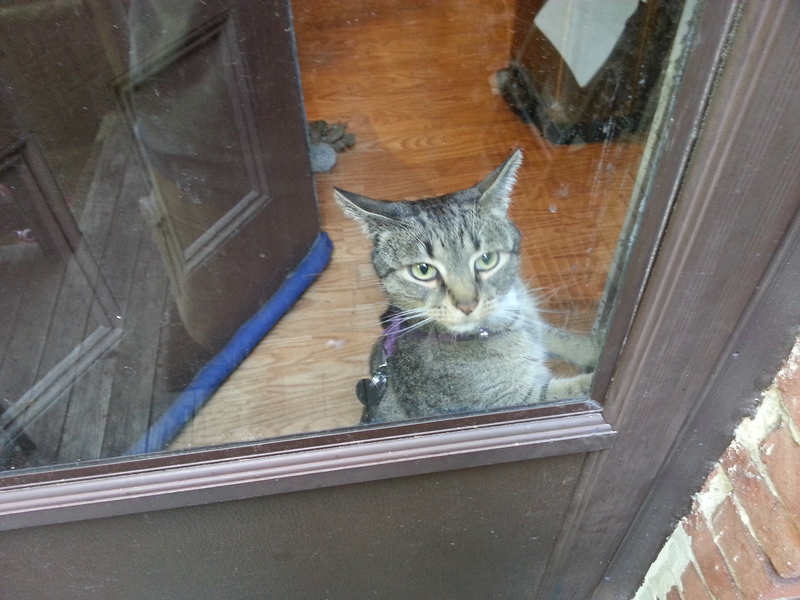 The dogs joined me (on and off) while I was working outside and a certain baby kitteh who thinks he is a dog wanted to join me too. He really doesn’t get it. Poor little Scratch. Anyway, more gardening stuff to come later. Previous Previous post: Spring has sprung, sorta.